There are plenty of books and online resources that elaborates on the ‘how-to” of introducing solids to babies, so I will not repeat the same thing here. There are also plenty of baby food cook books which you can refer to for recipes and ideas. I have also shared some of my Baby Food and Baby Porridge recipes. What I am going to share are a few basic principles I adhere to regarding feeding solids. This is in line with WHO and the AAP, as well as our own Health Promotion Board‘s recommendation of breastfeeding exclusively for at least 6 months. Breastfeeding exclusively means giving the baby only breastmilk and nothing else. No porridge, cereal or formula milk. Certainly no cereal in a bottle of milk to make the baby sleep through the night. This, in itself, is a dangerous practice because it is a choking hazard. Delaying solids until the baby is ready also saves you a lot of trouble trying to ‘teach’ the child to eat. Some parents are eager to introduce solids and are partly influenced by ill-informed doctors and older folks to introduce solids from as early as 4 months old. 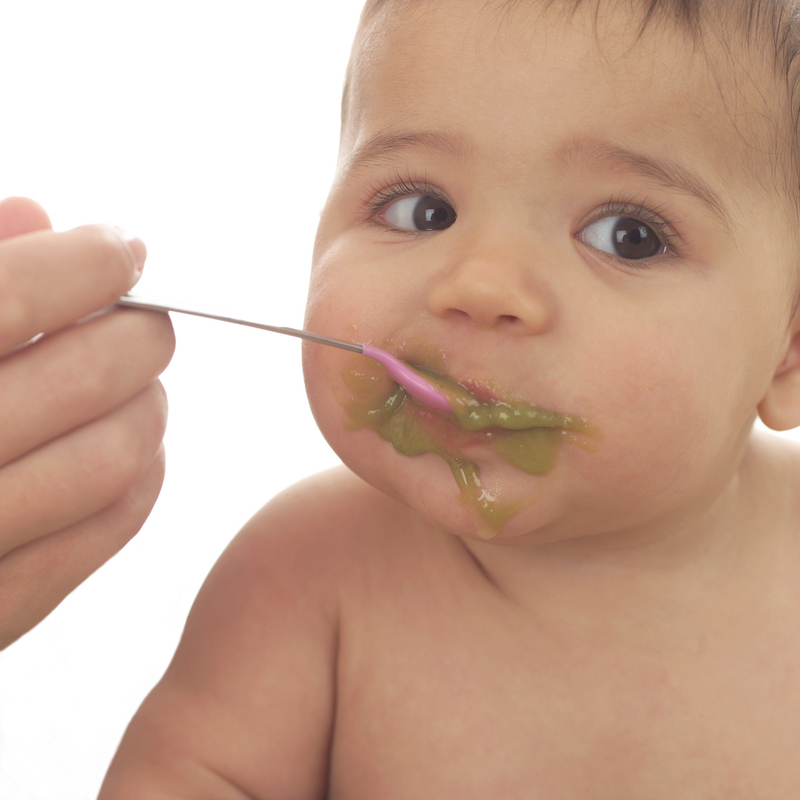 When you introduce solids that early, chances are you baby is not entirely ready for it. If you read books on babycare, you will learn about the signs of readiness, e.g. baby able to sit up on his own and losing his tongue thrust reflex. Some parents get really frustrated with their babies because their babies keep pushing the food out of their mouths. They try to ‘teach’ their babies to eat. The truth of the matter is that you do not need to ‘teach’ your baby to eat. Your baby will eat when he is good and ready. The reason why your baby pushes food out is because of his tongue thrust reflex, which is nature’s way of protecting your baby from ingesting and choking on solids before his time. The fact that your baby is pushing food out means that he is totally not ready for it. His body and digestive system is not ready for it. So instead of getting frustrated and angry, trying to ‘teach’ your baby to eat, delay introduction of solids until about 6 months and you will find everything a breeze. 2. I don’t use commercial baby food. Very rarely do I use commercial baby food. For my 2nd child, I only bought a jar of baby food once! That was because of unexpected circumstances and I was not prepared to feed him outside home and he was too young too eat table food. While adhering to certain guidelines about introducing solids, e.g. not giving egg in the first year, I try to expose my kids to different texture and different flavour. When they first started solids, of course, everything has to be pureed. But gradually, I will stop blending everything and just cook everything until very soft, retaining of the original texture of the ingredients. Commercial baby food also comes in textured forms for older babies. But really, texture is not simply a matter of smoothness and coarseness. Cooked the same way, the same amount of time, how a carrot feels in your mouth would be very different from how a piece of celery feels in your mouth. Getting your baby used to different food texture will pave the way for healthy eating habits later on. Your child will be less likely to spit out food just because it feels a bit strange in their mouth. Since we are Chinese, of course, the mainstay of our diet is Chinese food. Hence, for babies, porridge is the default weaning food. (I mean rice porridge, not oatmeal!) Apart from Chinese food, I also expose my children to different style of cooking, e.g. Italian, Indian,etc, at an early age. This means that they are exposed to different ingredients and even herbs and spices too. For really young babies, I may not give pasta yet, but I will use Italian herbs in porridge. You can check out some of my porridge recipes. You will find that babies who are learning to take solids are quite open to try different flavours. So this is the time to give them the exposure and get them used to eating all kinds of things (not withstanding the need to introduce food at appropriate age). I have come across children who are brought up eating mainly porridge – and very plain ones too – and their diet are seldom varied. These children usually grow up to be very unadventurous eaters and only stick to their familiar diet. It can be a problem for you if you want to eat out and all your child wants to eat is the porridge he is used to! Furthermore, this also means that your child is not getting a well-balanced diet. So remember this : one way to bring up a non-fussy eater is to start young. Expose them to all sorts of food. I mean healthy food. Not junk food. One of the most common assumptions is this : babies are not able to eat certain food. For instance, leafy greens and celery (which a lot of adults hate). Some people think that leafy greens are tough to eat since it is fibrous. So they assume that babies will not like it and will not be able to handle it. This is a mistake. Babies can handle most food as long as you serve it to them in the appropriate form. For very young babies, even leafy greens can be pureed. For slightly older ones, the leafy greens can be chopped into very small pieces and cooked soft. If you assume that babies cannot handle such vegetables and you do not introduce them to vegetables when they are young and open to all kind of flavours, it should not come as a surprise that they will not like to eat them when they are older. Both my boys are able to eat most vegetables. Yes, including commonly hated stuff like broccoli, eggplant and celery. My eldest boy likes Hong Kong kailan, which has an enormous (but very crunch and sweet) stalk, much to my mother-in-law’s amazement. Another common assumption is that young children are not able to take spices, especially chilli hot stuff. Think of Indian children, for instance. They grow up with all kinds of spices and don’t seem to have a problem with it! So yes, introduce stuff like cumin, tumeric and ginger. For an older child, slowly introduce chilli hot stuff. Start with something mild, like just some pepper in the food. In fact, for my older children, if they insist on eating something that are really very hot, I will not hesitate to let them try it after giving them prior warnings. I find that if it is something tasty, even if it is a little spicy, they are happy to eat them. They just drink plenty of water with it! Challenge their tastebuds but not torture them. What if you introduce something and your child does not like it? Yes, babies do exhibit certain preference too, even though they are relatively open to trying new things. My advice is to persistently introduce that particular food but do not force him to eat it. Forcing him to eat it through fuss, tantrums and tears will only make him associate that food with bad feelings. You should try to introduce the same food again the next time, and again, and again. It may not be the next meal. You can wait for a few days before trying again. Chances are, he may have forgotten that he does not like that food! Try different ways of cooking also. Slowly ‘teach’ your child to eat it. This principle of persistence applies to children of all ages. But for older children, you have to give them a bit more room for food preference. If it is a new food, I do insist that my boy at least try it first before saying he does not like it. In fact, sometimes I try to make him try it a few times. Everyone has some food preferences, including you and me. Your child will eventually develop his own food preference. As long as it is not excessive to the point of him being a fussy eater, and you know that he genuinely dislikes that food and it is not out of some other behavioural issues, I think it is fine. We have done our part in introducing them to a wide variety of food and ‘teaching’ them to eat all kinds of food when they are younger. As our children grow older, as parents, we need to learn to respect their choices and preference and food preference is one of them. Every child has a different appetite. Some are big eaters and some are not. A realistic portion is one that your child can finish, not one you think he should finish. If you insist on your child eating a portion that is completely beyond him, it will only lead to frustration for the both of you. Even adults are advised by doctors to only eat until you are full, or even 80% full, instead of to the point of being stuffed. If you child is a small eater, then consider giving him smaller but frequent meals. In fact, a lot of young children fall into this category of small and frequent eaters because their stomachs are so small. What you have to be mindful about is to avoid giving junk snacks in between meals. By this, I mean no junk snacks right before meals. Eating lots of biscuits and sweets an hour or half an hour before meal time is bound to spoil the appetite. Eating healthy snacks between meals (but not right before meals) is fine. You may be surprised by this : my kids are not big on the Big Yellow M. I am often surprised by parents introducing fast food to their very young children as if it is some kind of rite of passage ritual. The fact is that if you bring up your child on junk food, you are cultivating their taste for such food and you should not be surprised if they grow up wanting to eat nothing but junk food. Remember : you teach your children what to eat. My mother advised me to make home meals delicious so that my boys have good taste for food and will be naturally turned off by bad food. If they want burgers, make some nice home-made burgers with real and fresh ingredients instead of processed, reconstituted meat. If they want fries, make healthy baked (and still crispy) fries at home. Of course, once in a while, we do bring them to fast food restaurants. But this is more the exception than the norm. I discovered that they are more interested in the toys that come with the kid’s meal rather than the food itself. So I have made a rule : no kid’s meal if they want to eat at fast food restaurants. I can order food for them in a fast food restaurant if they really want to eat something there. But I will not allow them to go there just for some lousy toys that they lose interest in after a day. It is a waste of calories and waste of money. If you think that you are not a good cook and hence, cannot make delicious home-cooked food to cultivate the taste of your child, take heart! At least you are feeding him real, fresh food instead of fat laden junk food. Good food are not necessarily difficult to prepare. Not being a good cook is not a reason for introducing junk food. Your child will pick that up sooner or later without you making a point to introduce it. A lot of people use milk as a easy cop out for meals. Don’t do that! I have heard of people who are too lazy too cook and are just satisfied to give their children a bottle of milk as a meal. Milk, no matter what the milk companies tell you, is not a super space food with all the nutrients you need in it. If that is so, then all busy adults should just drink gallons of it instead of wasting time buying, cooking and eating food. The fact is that by the time your baby is around 6 months old, milk, be it breastmilk or formula milks, is not sufficient to meet all your baby’s nutritional needs. Hence, you need to start introducing solid food. In conjunction with the introduction of solids, I also make it a point to have the baby eat at the table with the rest of the family. The baby sits in his highchair, of course. I read somewhere that family meals are important for cultivating good eating habits. By family meals, I mean eating at the table together. Not everyone sitting in front of the TV with a plate. Eating becomes enjoyable because for children, it is always fun to do things together. The baby also gets to pick up good eating habits by watching the rest of the family eats. On top of that, eating at the table naturally means no running around. One thing I really cannot stand is a child running around during meal times while the adult who is feeding him chases after him with his food. Even when we are not having a meal together as a family, the baby stays in the highchair to eat his meal. On this particular point, I have been asked whether is it ok for the baby to be playing with toys or watching tv while eating his meals. Actually, I have no hard and fast rule about it myself. A young baby may not have the patience to stay in his highchair for a very long time. So if a bit of tv or a toy helps to keep him entertained, personally, I am fine with it. If the baby eats at the family table, you rarely need the tv. This is just my personal preference. I have also been asked what to do if the baby does not like to stay in the highchair. Firstly, start right. From Day 1, if you put the baby in the highchair for meals, it is more likely that he will get used to the idea right from the beginning. It is the same as carseat. Most babies will protest about being stuck in a carseat. Does that mean you let the baby go without a carseat? I hope not. Of course, highchair is not a matter of life and death like carseats. My point is just that similar to training for carseats, babies can be trained to sit in a highchair. Secondly, as I said, babies do get bored if they sit too long in their highchairs. If you cannot keep him in, there is no need to fret about it. What I do is simply take the baby out of the highchair and finish the meal in another place. For the next meal, I will still start with the highchair and then move on to another place when the baby acts up. But try to stretch the highchair time and try other means of keeping him there (which is why for me, having a toy is fine). Otherwise, the kid will just learn that ‘I just have to fuss and I will be out of this chair’. Sometimes, it may not be possible to use a highchair. E.g. when we are eating at the grandparents’ place where there is no highchair. Or it may be a party with children all over the place. As soon as the child is able to understand, I will always insist that he comes back to the adult who is doing the feeding to eat. In other words, he can take a mouthful and run off to play. But he must come back to take the next mouthful instead of having the adult run after him. Avoid using processed food such as luncheon meat, sausages, nuggets, pre-mixes, even breakfast cereals! Firstly, processed meat are high in fat content. It does not take a genius to guess that food manufacturers are not going to use the choicest cuts of meat for grinding up into processed meat. They are more likely to use fats, organs, skins which are leftovers parts that are not sold. Secondly, meat are preserved using sodium nitrite, which is carcinogenic. Thirdly, food that are processed usually contains high level of fat, even trans fat, sugar and sodium and have little nutritional content. Take a look at the ingredients list of one of those children-targetted, multicolour breakfast cereal. You will find that it is more empty carbohydrates, sugar and artificial colourings than anything. Yes, children love these processed food and frankly, I do agree it can be quite difficult to totally abstain from it. But it will be good not just for your children, but for everyone at home as well, if you can cut it down to the very minimum. As I said earlier, you teach your children what to eat. If you don’t introduce such food to them at a young age, they will not cultivate the taste for it. If you do not stock such food at home, they will have less chance of eating them. For the young ones, give them ample opportunities to eat finger food. This is the very first step towards self feeding. When the baby is older and shows interest in feeding himself with a spoon, do not be afraid of the mess and let him! You can find ways to contain the mess, e.g. placing the highchair on top of some newspapers, but do not miss this opportunity to let your baby practise self feeding. You can continue to feed him with one spoon but give him another spoon for him to try feeding himself. Once you miss this opportunity and the child get accustomed to being fed, it may be hard to get him to feed himself when he is older. Some things are not allowed though, e.g. throwing food. What I do is to very firmly say ‘no’. I will guide him to put food in his mouth. This is to show him how it should be done. If the child continues to throw food, I will take away the food or the spoon and disallow him to handle it. For the next meal, we will try again. 14. Vegetables before fruits? Fruits before Vegetables? To me, it really does not matter. Some say that introducing fruits before vegetables will cause the baby to develop a sweet tooth and not like vegetables later on. My experience does not confirm this. After all, breastmilk itself is sweet already. When the baby first starts solids and seasoning is not used, sweet vegetables are great for making the meal delicious. There is no need to season the food with salt or sugar, especially during the first year. One of these days, do this experiment : eat a spoonful of white rice and chew slowly, keeping the rice in your mouth as long as you can. You will find that it will gradually become sweet. This is because the enzyme in your saliva breaks down the carbohydrate in the rice to a simpler form, which is sweet in taste. I believe that unlike adults, who have been exposed to all kinds of food and seasoning and high salt and sugar content in food, babies have ‘untainted’ taste buds and are more sensitive to the natural flavour of food. Hence, something that is very bland to us is quite tasty to babies. Hence, seasoning is actually not necessary. Secondly, the baby’s system is still young and immature. Having too much salt and sugar will tax their organs. Even adults are advised to cut down on salt and sugar for health reasons. Most food are inherently sweet or salty. Hence, it is not necessary to add more salt and sugar.